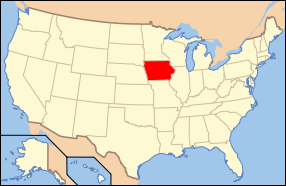 Prom, weddings, and sorority dances all have one thing in common in Iowa. 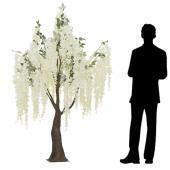 They all purchase their products through Event Décor Direct. This is purely because we are the best at what we do and we take great pride in the fact that we have one of the largest customer bases in the state. Our great customer service and wonderfully low prices are a challenge to many businesses across the state and that is why the people in Iowa call on us for their venue decoration needs. 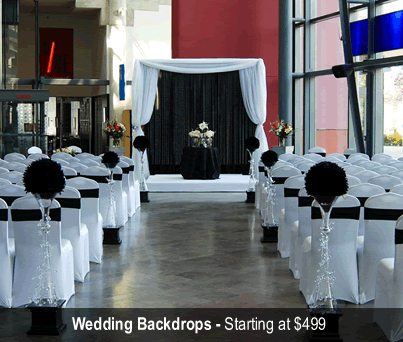 Wedding Backdrops - Event Décor Direct is Iowa’s #1 leading supplier when it comes to backdrops. 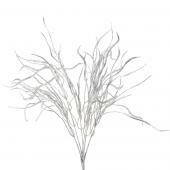 We offer and elegant selection for you to choose from. Whether you are looking for 1 or 3 panels of fabric backdrop or a single starlight window or maybe even a couple of arches, we will be happy to help you. 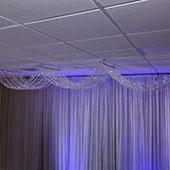 Backdrop Lighting - Backdrop lighting is perfect if you are looking to enhance the mood of any event in Iowa. Dim, bright or even colored we will have you covered by providing you with all of the necessary equipment for your event. From polished chrome pan lighting to “super bright” LED bar lighting we know you will find what you need. Crystal Décor - Buckles and brooches and acrylic crystal snowflakes too, we have a huge variety from which you can choose. Hollywood glamour is closer than you think because we have crystal acrylic in all sizes and colors, we even carry pinks! With one of the largest selections in Iowa, we have most of our competitors beat. Chandeliers - It will be hard for Iowa customers to pass our chandeliers with out thinking twice because of their wonderfully affordable price and gorgeous appearance. We have luxurious acrylic crystal chandeliers with up to 4 tiers. You can also take a look at our eco friendly, handmade willow chandeliers that will offer your guests tons of delight when they see them. Crystal Curtains - Crystal curtains will add an elegant effect to any Iowa wedding, they make great room dividers and covers for doorways. 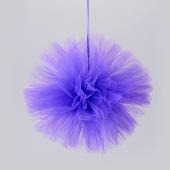 We have many different styles and colors from which you can choose. 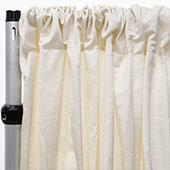 Crystal curtains also make a great addition to our fabric panel backdrops for that extra touch of luxury for you and your guests. 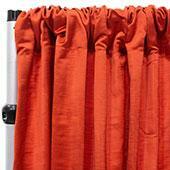 If you are looking to buy plastic crystal curtains in Iowa, you have come to the right place. LED Decorations - If you are looking for some lighting that is a tad less incandescent and conservative, why not try out our LED decorations? We offer a wide selection of LED lighting and decorations from curtains to flowers all of which have been rated near perfect by previous customers. The best of our LED products however, may help you to dance the night away and paint Iowa red. Our LED floor panels are great for any type of dance. Its multifunctional usage and master/slave link up will surely get your guests in the mood to dance like no one is watching. 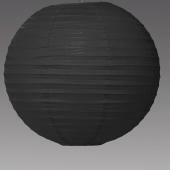 Candles - If you are looking for lighting that is traditional and still romantic, you should try out our candles. We have a vast array of pillar candles, square and round. We also offer less hazardous smart candles and even tapered candles. All of which will offer you peace of mind knowing you will have the appropriate mood lighting for your Iowa event. Ceiling Draping - A simple 4 panel ceiling drape is spectacular, yet cozy and quite, but if you are having a gala event why not go all out. Event Décor Direct can offer you a very sophisticated and intense 12 panel ceiling drape for a fraction of the cost that our competitors can offer. This is just one of the many reasons that we are #1 in Iowa. Chair Covers - Iowa wedding reception and Prom seating can be extremely dry and tasteless as many have experienced. 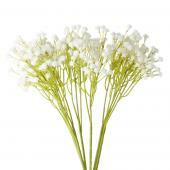 The best thing is that with Event Décor Direct it does not have to be so. We offer custom chair covers and even sashes that come in a broad selection of colors for you to match with your event. 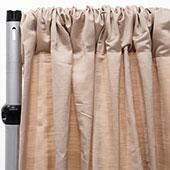 Event Linens & Drapes - No Iowa party is complete without linen and drape. If you would like your party or venue to have that extra special luxurious feel with out all the hassle and leg work that can be implied with our competitors, take a look at our linens. Our most popular linen is a satin striped table linen that comes in all the popular colors. 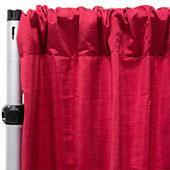 Pipe and Drape - Although all of our other products are simply fantastic, our pipe and drape is hard to beat. 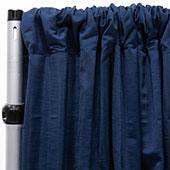 Pipe and drape are some of the most useful and universal products on the market. You can use it at a room divider or even as a dressing room for extra space, however you choose to use our pipe and drape is completely up to you. With prices as low as ours it is simply a crime to pass up, because you will not find a better deal in Iowa.